It only has the Administrators from the local server. e.g. Test2106/Administrators. 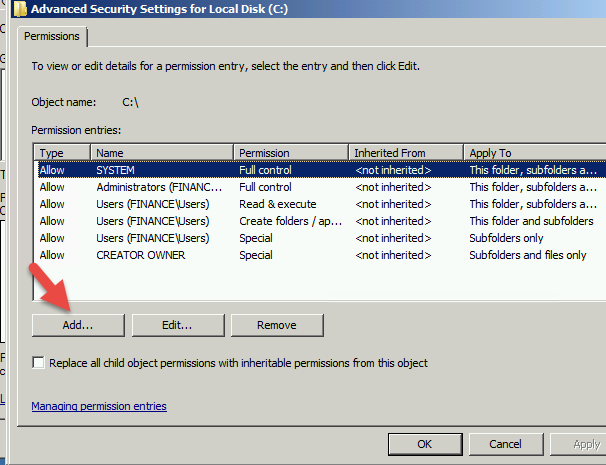 2016 hasn't really changed the permission or NTFS model of previous versions. The security enhancements touted are in under the covers hardening. Preventing apps from doing things they shouldn't. So what *specifically* are you trying to do? Anything a domain admin doesnt have permissions to do probably shouldn't be done. I noticed it because I was trying to change the desktop Theme. Domain Admin is not in the security settings. However, if I log on with my user name it works fine. Through the GUI or are you manipulating files? I guess I'm not being clear. When I log on as Administrator, there no security permissions and I can't edit them. The user Administrator is a member of Domain Users. If I log on as me, I have security permissions and I can add to the security. e.g. I can add Domain Admins to the permissions. I'm also a member of Domain Admins. My point is why are you manipulating those files at all. Changing the theme is done through the GUI, and is a per-user setting at that. So what you describe simply doesnt add up. you're focusing on the wrong issue. See the attached. On a new 2008 R2 server, logged on as Administrator the "add" button is available. On the 2016 server it is not. *sigh* never mind. You are choosing nit to read or understand. Good luck. "m out. you were correct. The user I was logging on as was not part of the Domain Admins group. Somehow the group got removed from the account.